On the heels of the Supreme Court’s recent ruling in Burwell v. Hobby Lobby, which found certain companies enjoy the right to free exercise of religion and could therefore refuse to cover abortifacients required by the controversial HHS contraception mandate, members of the U.S. Senate introduced legislation designed to undo that decision. The Court held that the contraception mandate violated the Religious Freedom Restoration Act of 1993 (RFRA), an overwhelmingly bipartisan bill sponsored by many of the same political figures now seeking to rewrite the First Amendment. Following a deliberately misleading campaign by religious liberty foes to claim that the Supreme Court “outlawed” certain forms of contraception (they did no such thing), Sen. Patty Murray (D-WA) introduced the “Protect Women’s Health from Corporate Interference Act” (S. 2578) that would not only reverse Hobby Lobby, but go far beyond that decision. The bill negates most rights that employers, insurers or employees may have, under RFRA or any other federal law, to opt out of federally mandated coverage. Contrary to Murray’s claims, the Supreme Court did not rule on whether these items should be available to women; rather, the Court ruled that RFRA protected Hobby Lobby’s right to refuse to pay for abortifacients. The HHS mandate requires virtually all health plans to cover all FDA-approved prescription contraceptives, female sterilization, and “counseling and education” promoting these to women and minor girls. It allows only a very narrow religious exemption, chiefly for “houses of worship.” Nonprofit religious groups serving the vulnerable, such as the Little Sisters of the Poor, receive only an “accommodation” requiring them to authorize their insurer or third-party administrator to provide the objectionable items. In its Hobby Lobby decision, the Supreme Court allowed an opt-out for family businesses with religious objections (the objection in this case being to drugs or devices that can be abortifacient); other cases are pending. But S. 2578 could have nullified many laws designed to protect conscience, once the federal government decides to mandate coverage of any item. Even the “exemption” and “accommodation” on contraception could be modified only in ways that serve the bill’s purpose of maximizing mandated coverage. Fortunately, S. 2578 was defeated today. 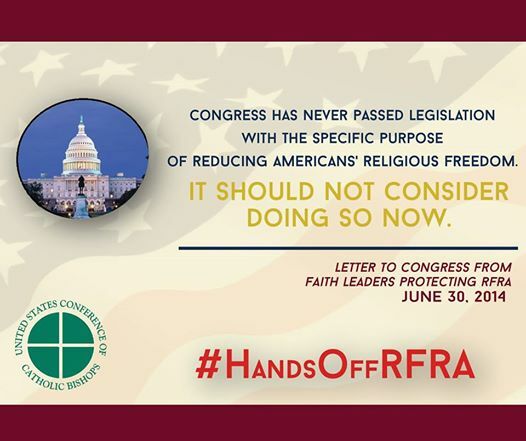 But the war on religious liberty continues, requiring us to be vigilant against threats that jeopardize the ability of religious Americans to act in accordance with their conscience and religious convictions.